Sailor Shikiori Shimoyo Ink is one of 4 new Sailor Shikiori ink colors released last year. The Shikori ink colors are a new addition to Sailors’s Four Season line of inks that originally have fallen under the Jentle ink series, with different packaging, size, and price. However, all of the Sailor Four Season ink colors are shifting to the new Shikiori bottle and price. We currently have a limited amount of original 50 ml. sized Sailor Four Season Jentle ink colors still in stock for sale. Sailor Shikiori Shimoyo ink (Frosty Winter Night) is a dark blue-black ink, with medium saturation and many well-loved characteristics found in Sailor inks. Shimoyo shows very dark and can be used as an everyday home or office ink color. Continuing reading for a chance to win the bottle of Sailor Shikiori Shimoyo ink we used for this review. 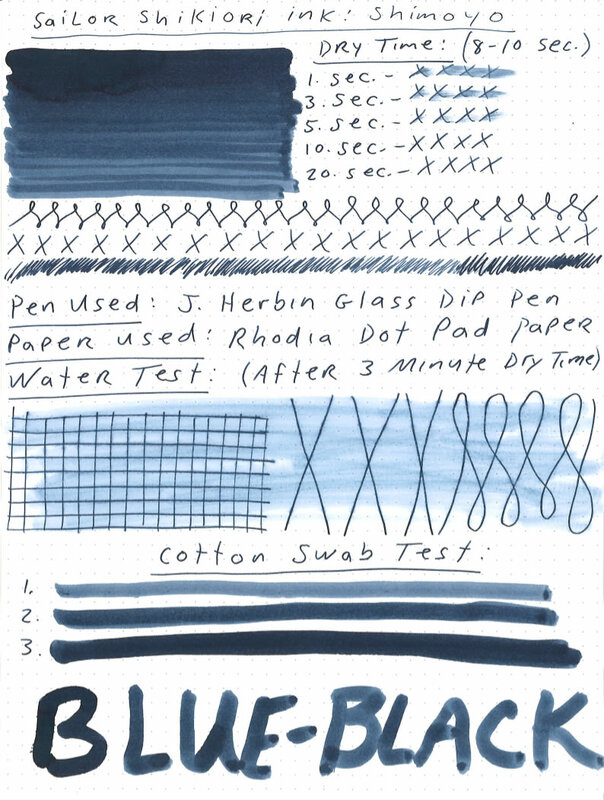 For our review of Sailor Shikiori Shimoyo ink, we used a glass dip pen by J. Herbin on Rhodia dot pad paper. The glass dip pen has a tip that is similar to a medium-fine fountain pen nib. 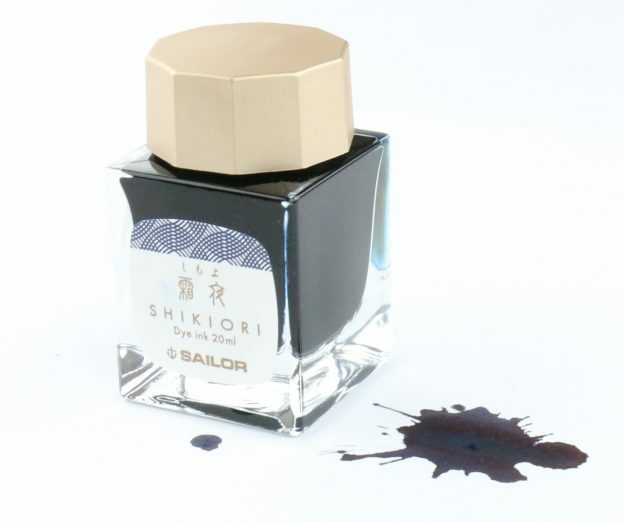 Sailor Shikiori Shimoyo ink comes in Sailor’s new smaller 20 ml. square heavy weighted glass bottle with an easy to open faceted lid. Although small, the glass bottle has a very nice presentation and does not reveal the English translation of the name. The outer box however contains a small colored sticker with the Shimoyo name. Sailor Shikiori Shimoyo ink is more expensive per ml. than the original Sailor Jentle ink bottles. This puts Sailor Shikiori Shimoyo ink in the mid to high range for bottled fountain pen ink on the market today. During our review of Sailor Shikiori Shimoyo ink, we found a dry time of approximately 8-10 seconds, which is not unusual for a medium saturated ink. Being under 10 seconds makes the Shimoyo ink an available option for use as an everyday ink. We found absolutely zero bleeding during normal use while testing Sailor Shikiori Shimoyo ink. However, during our cotton swab, with a large amount of concentrated ink, we did notice some slight bleed through on Rhodia paper. During our review of Sailor Shikiori Shimoyo ink, we found no feathering using the glass dip pen on Rhodia dot pad paper. Even during the water test, there was very little additional feathering produced. During our review of Sailor Shikiori Shimoyo ink, we conducted a water test where we ran a wet cotton swab over a dried ink sample. The results were significant color smearing, but no additional bleeding and very little noticeable feathering. The lines remained clear and legible throughout the test. Being a very dark color, Shimoyo ink may produce some shading under the right conditions with the right nib and penmanship. However, most hands will produce a pretty consistent dark color line without a lot of color variation. Sailor Shikiori Shimoyo ink is a great blue-black option. It has many of Sailor inks wonderful characteristics including reasonable dry time, nice saturation, beautiful color, etc. The presentation and bottle of the new Sailor Shikiori line are fantastic. However, the price has increased compared to the original Jentle ink bottles, as will all of their Jentle inks in the very near future. Although the new Sailor ink bottle size and price is here to stay, the presentation, look, and ink continue to be top notch. Happy writing this Frosty Winter Night from Japan! This entry was posted in Fountain Pen Ink and tagged fountain pen ink, Giveaway, review, sailor on February 4, 2019 by Pen Chalet. I love blue-black inks and this looks worthy of a special sponsor in my ink cabinet. That is a beautiful ink. I have become a big fan of blue and blue/blacks. Those shades comprise mist of my collection. Seems very interesting, I love blue-blacks. I have always had one or more blue-blacks in my rotations. I would love to try another. Would love to see a review of iron gall inks next… how safe are they? Great review and I’d love to see some Krishna ink reviews. I like blue-black inks. Ideal for everyday writing for school/college/work. I’ve never used this brand, and I’d very much like the chance. That’s a very nice blue-black! If I don’t win, I might have to pick up a bottle! This is a Blue Black I would certainly use. Nothing wrong with a few more blue- black options in the cabinet! Looks like a great colour. Thanks for running the give away! Black-anything’s are always a favorite in my book! Blue black is my all time favorite ink and this one got me excited. I’ll be hopeful. Can never have too many blue-blacks in your collection. The Shikiori lineup seems to have all winners. Thanks for the great reviews and giveaways! Love Sailor ink! I like blue-black inks. Ideal colour for school/college/office. Wow. Looks good. Gotta try it out. I am certainly quite pleased to see that you decided to showcase an ink from Sailor for this review! I am a big fan of their Sailor PGS fountain pen, but have never used any of their inks before. It seems like a simple ink, but I’m fond of lightly softened blacks for handwritten text. Something about that wash color makes me want to use it in a monochromatic or dichromatic sketch. Maybe because it seems so versatile and effective. It makes me wonder how well it might mix with other inks, and how other options in the same line might function (Yozakura and Yonaga look particularly great). Imagine a mild pink tint in the ink! I think it may be worth exploring more Sailor inks now and in the future. Perhaps some more inks from 3 Oysters as well. I’ve never had a Sailor ink but I imagine it would be close to the Iroshizuku line of inks. That being said, Kon-Peki is my favorite. Would love to see a sage colored ink! I love blue black and this looks great! My current favorite ink is Monteverde Copper Noir. Thank you for this review. While others people will undoubtedly continue buying Sailor ink even after they discontinued the 50ml bottles, I am not one of them. It was a very poor decision on their part, and I won’t buy the new bottles. That being said, this ink is beautiful and I would love to write with it. I am looking for a shading blue black ink now and this looks wonderful. I think that color is so pretty! I would love to win and thank you for the opportunity! I really like the color of this blue-black! I’d love to see reviews that compare similar inks. I’ve e been eyeing this one for a while. I think your review sealed the deal. Thanks. Lovely color. I’ve never tried a Sailor ink. My current daily ink is Rohrer & Klingner Cassia.